Home » Food & Drink » Is It Vegan? Ham is vegan now, guys! Just scanned sliced ham, store bought and packaged and it said “probably vegan”. I’m done. I’m newly vegan & was really excited to find this app, but I can’t even read the ingredients list explaining why it is or isn’t vegan without a pop up add (with no way to close out) takes over my whole screen. Completely useless if I can’t read the info I downloaded the app to get! This is a really good app. I’ve used it for 4-5 years here and there. I do also double check the ingredients list myself just in case it said something is vegan that actually isn’t. For the past 6 months this app can’t even be used. As soon as I open it the app crashes and kicks me back to my home screen. You can’t even post on the apps page directly to the app developers with this issue it said 405 action not allowed or something. Don’t know if they even care at this point. I was hoping that there would still be updates for it, improvements, bug fixes, etc but there’s been nothing. Really disappointed and going to delete the app. The ranch corn nuts product is currently being listed in your app as containing dairy which it does not. I have confirmed with Peta, along with looking at the back of the bag, and this product is fully vegan. Your app states we can email you to correct any errors we may find but anytime I try to do so it is giving me an error message. EVERYTHING I scanned came up as “not sure” or “possibly vegan”. Simple foods too like bread and salad dressing. Very frustrating...I got the app to help with the tricky foods that aren’t fruits and veggies etc. 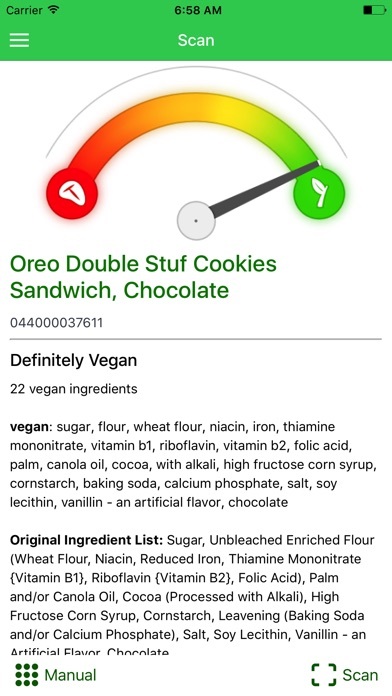 I’m vegetarian transitioning to vegan so I wanted an app to fact check me and make sure I don’t miss any non-vegan ingredients listed in the foods I’m buying, but if the app “isn’t sure” then I’ll stick to figuring it out myself. Uninstalled. My app crashes every time I try to open it. Not accurate and most of the time just plain wrong. This app simply does not work. It never gives correct information. Disappointing because it would be a very useful tool. This app crashes it won’t even open on my iPhone 8. When I used it on iPhone 6 the ads were so annoying.